Signed to a $20,000 bonus by the Philadelphia Phillies out of high school in 1946, Lopata toiled in the minor leagues and didn’t reach the majors on a full-time basis until 1954. Employing a crouch batting stance suggested by Rogers Hornsby, in three seasons as the Phillies catcher, Lopata hit 68 homers, including his career-best totals in 1956: a team-record for catchers of 32 home runs and 95 RBI. He played in the 1955 and 1956 All-Star Games. A series of injuries slowed down Lopata’s career considerably until he was forced to retire in 1960. Roy Campanella won three National League MVP awards in the 1950s. But in mid-decade Philadelphia’s Stan Lopata showed the future Hall of Famer he wasn’t the only power-hitting backstop in the circuit. Stanley Edward Lopata began his baseball career on the sandlots of Detroit. After starring in baseball and basketball at Southwestern High, he also played in the tough American Legion league. 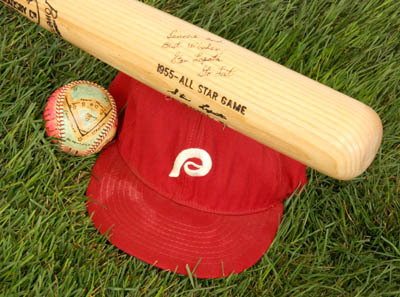 He was such a top prospect the Phillies lavished a $20,000 bonus on him in 1946. The Phils first assigned Lopata to the Terre Haute Phillies of the old Class B Three-I League. There in 1947 Lopata hit a respectable .292 while collecting the surprising total of 11 triples. The next spring saw Phils manager Ben Chapman pondering whether he should promote Lopata all the way to the majors. But instead Philadelphia assigned Lopata to the Class A Eastern League’s Utica Blue Sox, where he batted .325, improved his triple count to 13 and was named Eastern League MVP. After he hit .285 for the International League’s Toronto Maple Leafs (in one game he drove in eight runs), scouts labeled Lopata a “can’t miss” prospect. By 1951 the frustrated Phillies optioned “Big Stash” to Baltimore in the International League. Even there he struggled, batting just .196 in 38 games. Lopata returned to the big leagues in 1952 but still failed to impress. By 1953 he had been in the majors for parts of six seasons and his season-high for homers was just eight. In 1954, however, Hall of Famer Rogers Hornsby provided Lopata a badly-needed tip: try a batting stance, get into a crouch and get a better look at each pitch. Stan batted .290 with 14 homers in 1954. In 1955 he was named to the National League All-Star team, replacing the injured Campanella. His 1955 season was solid: 22 homers, 58 RBIs, and a .271 average. But no one could have anticipated what Stan accomplished in 1956: 32 homers and 95 RBIs. Thirty home runs tied the Phils team record for homers by a catcher; his 95 RBIs tied him with outfielder Del Ennis for the team lead in that regard. Once again he was named to the NL All-Star team, as Walter Alston designated him as a replacement for injured Milwaukee backstop Del Crandall. Another highlight for Lopata that year came when he hit a two-run homer on August 11 to shatter Don Newcombe’s streak of 39 2/3 consecutive scoreless innings. Even with all these injuries Lopata still hit 18 homers and 67 RBIs, but his average dropped to .237. In 1957 he suffered a more serious injury. On July 11, caught in a rundown between third and home he twisted his right knee. In the off-season he underwent surgery at Temple Hospital and then a five-day-a-week rehabilitation regimen at Connie Mack Stadium. Yet there was no repairing the damage. In 1958 Lopata played in just 86 games and struggled to hit nine homers. On March 31, 1959 Lopata left the Phillies, being traded to the Milwaukee Braves with shortstop Ted Kazanski and pitcher Johnny O’Brien for pitcher Gene Conley, infielder Joe Koppe, and infielder Harry Hanebrink. Lopata saw little service behind Del Crandall. In 1960 the Braves optioned him to Louisville (where in 55 games he hit .246 with 12 homers). They recalled him that September but released him a month later. But when his career was over, Stan Lopata had accumulated over 116 homers and 397 RBIs in just 853 games. “Big Stash” was inducted into the Pennsylvania Sports Hall of Fame in 1988. Lopata made his home in the Philadelphia area and worked for a concrete company. He retired as vice president of sales and now lives in Mesa, Arizona. “I’ve taken up wood-carving, making Kachina dolls and playing a lot of golf,” he explained.